The Dental 3D Cone Beam CT (CBCT) that our surgery uses, is a computed tomography that can acquire volumetric images and are therefore inherently three-dimensional, allowing us to section or “slice” volume in order to analyze the teeth and all anatomical structures which make up the oral cavity, in all points, angles and sections of interest to us.. This new system allows us to perform the dental CT with a cone beam able to minimize and optimize the level of exposure to X-rays, the radiation dose to the patient markedly lower than that given by traditional CT equipment (about 1/20°). This allows us to perform these tests on a regular basis or with negligible X-ray exposure, even on younger patients, without any compromise to the quality and clarity of images that result impeccable. Thanks to the use of special software, it is then possible to process the data obtained from the CT scan making it easier to obtain an absolutely accurate diagnosis. Starting with the CT we then proceed with surgical planning and computerized, guided surgery. These methodical approaches enable us to carry out micro-invasive implant surgery. In fact, the data that is obtained from this type of radiological analysis allows simulation of oral surgery or placement of a dental implant with extreme precision. Is your Studio equipped with this apparatus? Yes, our Studio has it own Cone-Beam 3D CT and Digital Panoramic device of latest generation (equipment that Dr. Benzi helped to develop and test together with Finnish engineers) in order to provide our patients with an extremely high level of accuracy in diagnosis and consequently, in setting the grounds for therapy, even in the most complex cases, as from their very first appointment; all of this with low X-ray exposure. Possibility for the dentist to have a precise and detailed volumetric 3D CT, as well as to obtain sections of any portion of the volume obtained: the image resolution is in sub-millimeter sizing and therefore we can make extremely accurate anatomical evaluations, an essential condition for an accurate and effective diagnosis. In the same way we obtain data from the CT it will be possible to recuperate other data by using appropriate software : two / three dimensional analysis, virtual endoscopy, surgical planning and computer guided surgery. Least damage to the patient. 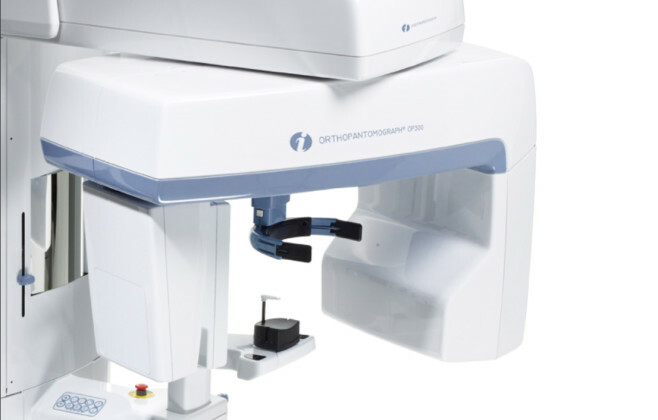 In fact, the CBCT is performed with an extremely low radiation absorption (roughly as much we absorb in our latitudes in about 9 – 10 days in normal life). Cost and time saving. In fact a patient can have tests done in our surgeries in a few minutes, that would otherwise take days to do in specialized X-ray centers.